A recent informal poll found that astronomers don’t yet have a good collective noun for a group of black holes, but they need one. The red circles in this Chandra Observatory X-ray image identify a group of a dozen black holes that are members of binary star systems. With 5 to 30 times the mass of the Sun, the black hole binaries are swarming within about 3 light-years of the center of our galaxy where the supermassive black hole identified as Sagittarius A* (Sgr A*) resides. 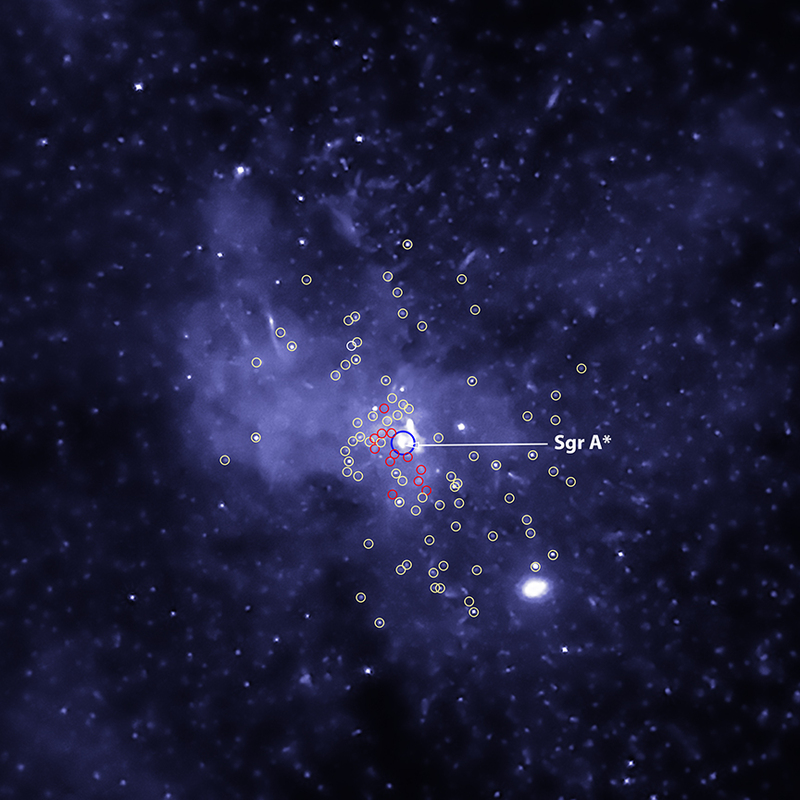 Yellow circles indicate X-ray sources that are likely less massive neutron stars or white dwarf stars in binary star systems. Alone, black holes would be invisible, but as part of a binary star system they accrete material from their normal companion star and generate X-rays. At the distance of the galactic center Chandra can detect only the brighter of these black hole binary systems as point-like sources of X-rays, hinting that many fainter X-ray emitting black hole binaries should exist there, as yet undetected. Posted on Saturday, 12 May 2018 by VGC	This entry was posted in ifttt-photograph and tagged IFTTT, NASA. Bookmark the permalink.